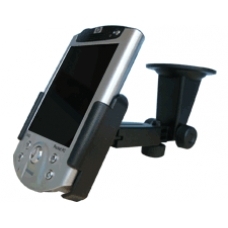 A high quality European made Executive Tower Mount that is an elegant solution to the problems associated with mounting your iPAQ within your car. This is an excellent and vibration free iPAQ car holder that is ideal for use in combination with your GPS satellite navigation receiver. Its screw tightened swivel head allows your iPAQ to be held in either horizontal or vertical positions and the extendible arms make this mount extremely easy to use; once the required position is set you are ready to go! The strong hold suction mount maintains its position safely on your dashboard or windscreen. iPAQ shown for illustration purpose only and is not included. We are confident in the high quality build of our iPAQ holders, and as such these holders come with a 12 month guarantee.